Nissan specifically outfitted a version of their NV200 Compact Cargo van in a successful bid to become New York City's "Taxi of Tomorrow". Introduced in 2014, the Nissan NV200 Taxi was engineered with a full-array of features tailored towards a modern experience for drivers and passengers incorporating several innovative ideas. The interior utilizes the van interior as a taxi cab capable of accommodating four passengers and their baggage. Fare-paying passengers inside the NV200 Taxi rode inside a bright, spacious and technologically-integrated cabin. Viewing perspective of a transparent roof panel, flat floor area, easy-to-clean seating and a mobile charging station were all provided during point-to-point travel. Drivers and taxi owners operating the Nissan van are provided with an efficient vehicle propelled by a 2.0-liter four-cylinder engine capable of achieving an average driving range of 25 miles per gallon. NissanConnect with Navigation and Mobile Apps featuring a 5.8-inch touch-screen was added to the 2015 version of the NV200 Taxi. 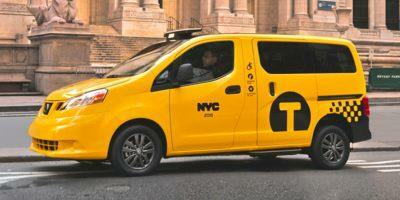 Starting in 2015, the Nissan NV200 Taxi's position as the exclusive cab for New York City is resulting in the vehicle becoming a highly common sight in the Big Apple. The NV 200 Taxi is exclusively designed for commercial usage.